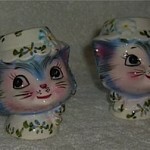 Do you collect Lefton Miss Priss pieces? 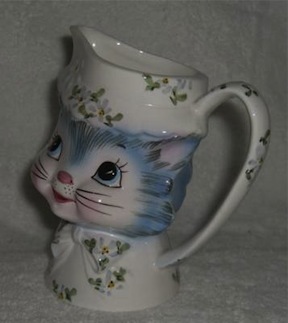 Did you know that Lefton’s Miss Priss was made in Japan from the 1950s-1973 and include various pieces in the product pattern. 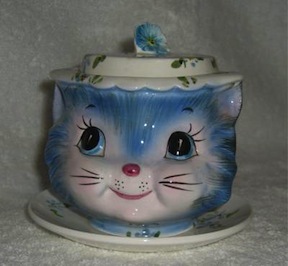 The Miss Priss product line that I have seen features a cookie jar, double tidbit tray, sugar and creamer, teapot, wall pocket, salt and pepper shakers, jam jar, tea bag holder, children’s bowl, covered butter dish, spoon rest with shaker, head vases and there are probably more. 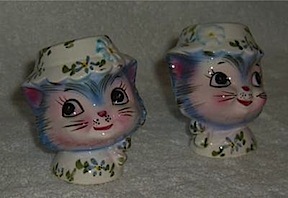 Lefton Miss Priss is not just for the cat collector as she is a lovely kitty cat crafted by the Lefton artisans of yesteryear to showcase her expressive face and animated features. 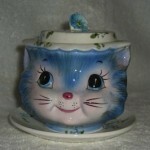 Miss Priss is exquisitely detailed in colors of pinks and blues and usually has a bow either tied on her collar or neck. 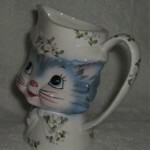 Miss Priss is sure to brighten any home and kitchen with her sweet charm! Why by new when vintage and retro collectibles from the 1950s – 1970s are so colorful, durable, and have charm and history! If you are interested in any of the Miss Priss items featured here please visit HERE.